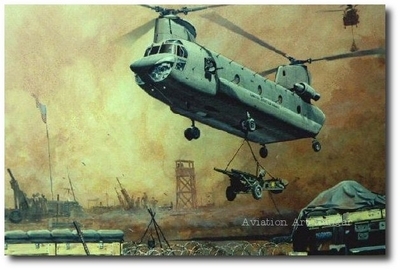 "Iron Dance" depicts a CH-47 coming in to a firebase with a 105 Howitzer slung underneath. The ammo load under the 105 is already on the deck with the howitzer still several feet off. Another Hook is visible in the distance on long final in the upper right. 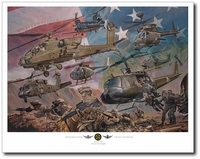 There is a 105 battery in the background and an American flag being blown around on it's pole by the rotorwash. The foreground aircraft is seen from a front 3/4 view of the left side, with some of the underside visible also.